Most of us know that, when enjoying any sort of physical activity, hydration is important. 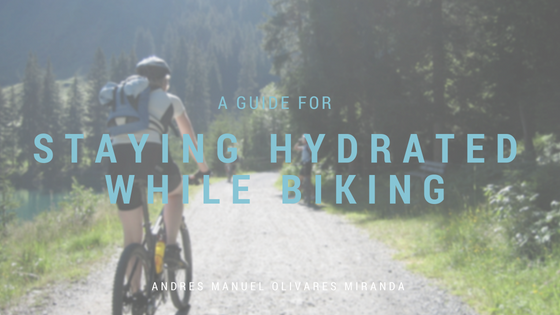 Cycling is no exception, so here’s everything you need to know about staying hydrated while biking! Being hydrated in general will lessen your chances of dehydration on the bike. We’ve all heard that eight glasses a day is the amount of water we should be drinking and though it is a good place to start; everyone’s needs are a little different. Gauge your hydration based on the color of your urine. A dark color would indicate that you’re indeed dehydrated, while a light yellow color shows that you’re well-hydrated. Colorless urine may mean that you have a little too much water in your system. If you are dehydrated, drink some water and wait a little while before beginning your bike ride. During physical activity, your body loses electrolytes and water when it sweats. Sports drinks, like Gatorade or Powerade, are great for replenishing electrolytes, but they shouldn’t replace all of the water you drink. They can also contain artificial sweeteners, flavors, and color dyes, which you may not want to be putting into your body in general. If you want the absolute healthiest option for replenishing electrolytes, you should drink coconut water. It’s a natural sports drink that is full of electrolytes and antioxidants great for rehydrating quickly. When your body is adequately hydrated, you’ll be able to perform at your maximum capacity. You’ll also avoid cramping and recover more quickly from long or strenuous rides. When cycling, your body needs to have enough water to lubricate the joints in your body. Long-term damage to the body can result from cycling too often while dehydrated. If you’re preparing for a strenuous ride or competition, make sure you spend the days leading up to it adequately hydrating yourself. Doing so will have a great impact on your energy levels and performance during the ride. Remember that sipping water throughout the day is most effective. It’s a common misconception that drinking a bunch of water in one sitting will make up for a lack of water prior to drinking it or that it will compensate for lack of water later in the day.